Among three-year-olds, full-day preschool enrollment increased from 18 percent to 21 percent, and part-day preschool enrollment changed little from 18 to 17 percent (CPS Table 2.7). 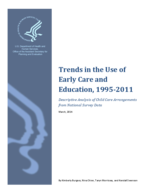 Four-year-old enrollment was consistently higher in part-day (33 percent in 1995 to 35 percent in 2011) than in full-day preschool (25 percent in 1995 to 28 percent in 2011). Percent enrollment in part- and full-day preschool remained stable from 1995 to 2011 (CPS Table 3.7).